W.O. Bentley still has a significant presence at Pyms Lane, Crewe. It’s the home to the luxury British car brand that takes his name, and as you enter the small but perfectly formed museum there’s a large image of him looming above. As imposing as W.O. is, it’s what’s behind the him that attracts most attention. There stands the EXP2, the oldest Bentley in existence that was, in its day, faster than anything else on the road, and a marker for Bentley’s of the future. It’s the start of a trip through Bentley’s facility, immersing me in a world of high octane engines, classical craftsmanship and modern manufacturing, and finding out just what makes a Bentley a Bentley. The first surprise is the level of automation. Despite being owned by corporate giant Volkswagen, a Bentley remains fundamentally hand built. The cars inch their way down a production line, hanging from giant clamps, before stopping at each station for precisely 16.8 minutes. At every stop, some of the 4,300 staff members start assembling their small part of the car by hand. In front of me a robot appears to install the dashboard, but it’s just a hefty lift that makes it easier for the workers to swing into place before manually attaching it to the car. Another 46 stations see a bare shell gradually turn into a luxury motor car, each step appearing to be automated but the skillful work is done by an army of workers, aided by machinery. 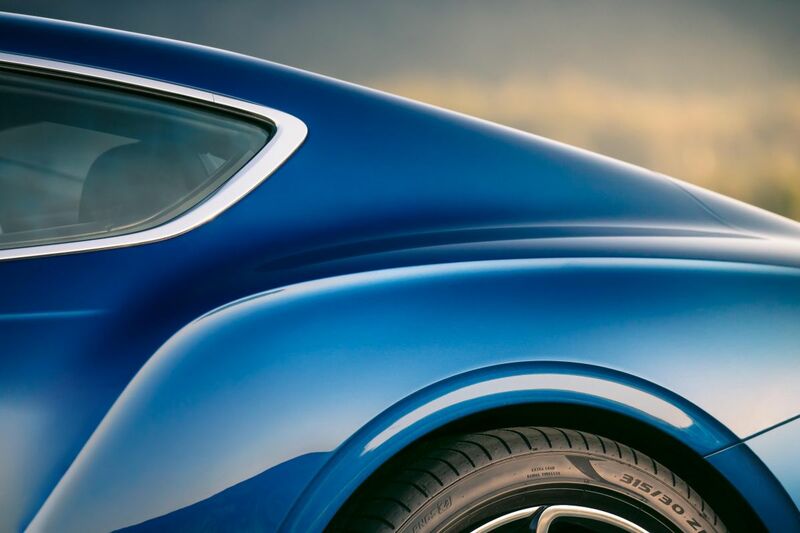 It’s a wonderful combination of old and new technology, and sets the tone for what a modern Bentley is. True British quirks appear though, thanks to the way the factory has expanded from a WW2 facility building Merlin engines for the Spitfire. Production stops briefly for each car as it’s transported from one building to another, across a road under a makeshift roof that looks rather less than waterproof. The second building is where the interior really starts to take shape, and the famous veneers are produced. Stored in a humidity and temperature controlled building, wood is shaved from metre-wide lumps down to a thickness of just 0.6mm, with the sheets stacked and stored in bundles made from the same part of a tree. This allows for book matching and mirror imaging of the grain, producing a near-perfect symmetrical image of patterns once fitted to the car. It looks like there’s just one piece of wood, but up to 24 veneers can be used in each car. There’s more than just sticking a piece of wood to the dashboard, though. They’re bonded to an aluminium substrate with tulip-poplar wood and glue under immense pressure. Several sanding and polishing steps - by hand, naturally - get things as close to perfection as possible, before five coats of lacquer are applied. While wood is the choice of most buyers, from rare Vavona to traditional walnut, younger buyers are tending towards carbon fibre or even stone inserts. The same level of craftsmanship holds true with the leather, where 14 hides from northern European bulls (fewer insect bites and no barbed wire knicks, apparently) are used on each car, sewn together by hand. Even something as mundane as a steering wheel requires 10 separate pieces of leather, each hand stitched, in a process that takes four hours. Customisation plays a large part in building a Bentley, with customers demanding ever more detailed changes to make a car their own, from a monogram on the headrests (a Bentley logo takes 4,00 stitches) to individual paint choices. However, the same holds true in more mundane motors, with Citroen’s C3 Aircross offering 85 different colour and trim combinations, while Vauxhall’s Adam has, theoretical, more than a million possibilities. While the build process for a mass-produced car is undoubtedly more mechanised, the manual labour required is still incredible, with Nissan employing around 6,700 workers at its Sunderland factory. Visions of robots churning out car after car are wide of the truth, with production of a new car being a combination of manual and automated labour. Being able to get close to the people that turn those dreams into a reality, and even see your car making its way down the production line at a later date, really helps build that bond between buyer and brand, so it’s no surprise that many manufacturers are now offering factory tours, including Jaguar, Mini, Aston Martin, Lotus and Land Rover. Bentley's tour offers a glimpse into a world few of us can afford, but it does help you realise exactly what it is that the money is being spent on. W.O. Bentley wanted to “build a fast car, a good car, the best in its class." On the evidence in the factory, they might just be succeeding.